Kimberly, Wade, Jax, and Lawson all came over for Halloween. The boys were all Cavemen. Kimberly made their costumes. We hit Sonic around 5 p.m. and then headed to our hood to trick or treat. We started early which was a great thing because they were done by 7:30. We saw so many friends and neighbors. It was awesome. I love this one above!! I just wish Lawson was looking up. I love how Jax and Gray are looking at each other and Lawson is trying to get in on the action. Tyler had no problem getting in character. Gray loved trick or treating. He would wave and say "Bye" about a million times as we walked away from each house. He also wouldn't put his candy in his bag. He was trying to hold on to all of it. Can we say Sugar High? Lawson and Gray's cool ride. Honey and Jessie brought over two costumes for the Sam and Gray. Aren't they cute? It is a little hot for them right now. I can't tell you what the boys are going to be for Haloween. You will have to wait and see the pictures. The boys plus their cousins are all going to be the same thing. Can't wait!!!! The weather has been so nice lately. It is a little too warm for me today. I love when the boys can start wearing their Fall clothes. On Saturday after Blake's football game we loaded up the boys, plus Parker, and Wade, Kimberly, Jax, and Lawson and went to a Pumpkin Patch at Sweetberry Farms. My Boys! Tyler is holding himself up to get his face in the frame. That face is crazy! Sweet Lawson sat here for the longest time so content. How cool is a boat full of pumpkins? We could not get a good picture with all the boys! Sweet Parker isn't even looking at the camera. Gray driving the tractor full of pumpkins and Parker hitching a ride. All of us, except Jerm and Sam, on the hayride. Sam was busy getting a tractor painted on his face. I can't believe he chose face painting over the hay ride. Oh well!! Again, way too hard to get a cool picture with the truck in the background! Tyler, Lawson and Jax are doing pretty good, but poor Sam and Blake they couldn't hang on to those boys. Gray and Parker aren't having it. I must of said "Don't throw the pumpkins!" about 50 times. This past weekend Lindsey and Derek traveled to Atlanta for a wedding. I kept Parker along with my gang and we had a great time. I told Jeremy that I could so have five kids. He looks at me like I am crazy!! It is true that Parker and Gray are like Thing 1 and Thing 2 on Cat and the Hat. Anyway, I had to get this picture. (Tyler wasn't too fond of this. He was in the bath first and slowly the troops started climbing in. Ty usually showers to avoid this from happening.) I really don't think that one more boy could fit in this tub. When it comes to football we are so HAPPY around here! Texas and Alabama are doing so good. It is really fun. 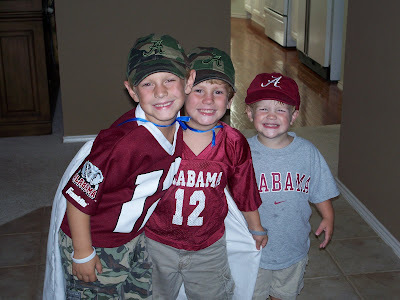 The boys rotate between their Alabama and Texas t-shirts all the time. I wish I had a recent picture. I just had to give a shout out to our two favorite teams, even though in our hearts, well maybe just mine and Blake's, Alabama is #1. The boys ask me if I will ever be Longhorns fan and I say "When I have lived in Austin as long as I have lived in Alabama, I might consider it." Roll Tide!!! *this is the only picture I have to post. I am such a slacker. 1. Jeremy and I took a trip to Atlanta for our good friend Brent's wedding. It was awesome. We stayed with our dear friends the Burton's. We saw so many college friends and South Florida friends. Did I mention we didn't have our kiddos with us? I read all the way to Atlanta and all I carried on the plane was my purse. Wow!!! I owe Lindsey big time for watching my boys. 2. Blake is loving football and Tyler starts basketball this week. 3. Sam is really funny. Quick Story: I was praying for the boys before I dropped them off at school and at the end I said "and everybody says...amen" and Sam said "No Mom! And all God's people say...amen." 4. Gray loves cell phones, keys, and shoes.